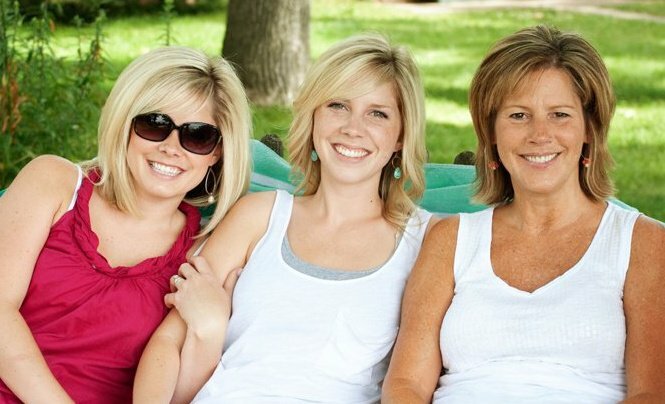 today i’m having my first guest post-er and the guest is: my mom! [who just so happens to also be kate’s, over at the small things blog, mom too. small world, right? our mom is one of the most creative people i know. she’s an incredible interior decorator, amazing cook, great party hostess, and gift-wrapping extraordinaire. a few months ago, when my sister and I were home in chicago, the three of us did some antique shopping and my mom found some great old windows that she bought. she wasn’t totally sure what to do with them, but knowing her, she was quickly going to find a purpose. and she did! 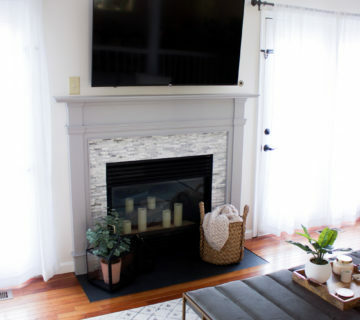 so, i wanted her to share her photos and a little advice on how to decorate and accessorize your home without spending a tiny fortune. that’s her on the right! So, here we go…..hit those antique stores and even people’s trash cuz there are jewels just waiting for you! 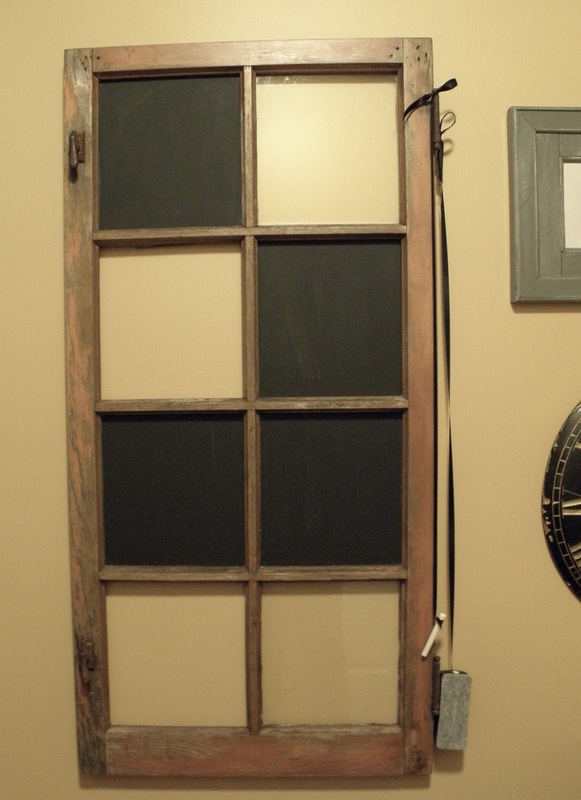 I wanted to tweak my mudroom a bit, but didn’t want to spend much money, so I found this old window for $10, knocked out a couple of the cracked panes, left a couple of panes plain and painted chalkboard paint on four of the panes. Then I tied an eraser and piece of chalk on to the hinges with long ribbon. It’s now a great place to leave notes to myself or greetings as people come to visit. See the picture with the keys? That was a green frame I had, I spray painted it gray, roughed it up with sand paper, glued keys (that I got for $1.50 at Michael’s) on craft paper and slipped them in over the glass. Another addition to the room….cost about $7! I stood this window up against the mirror. 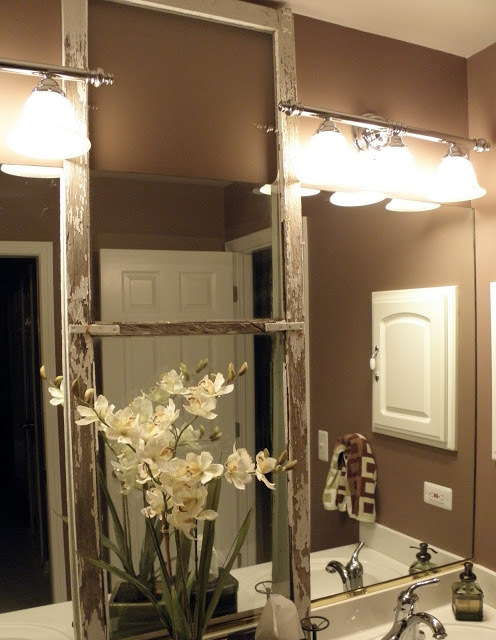 You still see the mirror through it, which still gives you the reflective value of the mirror for the flowers, yet it adds awesome character to the room. 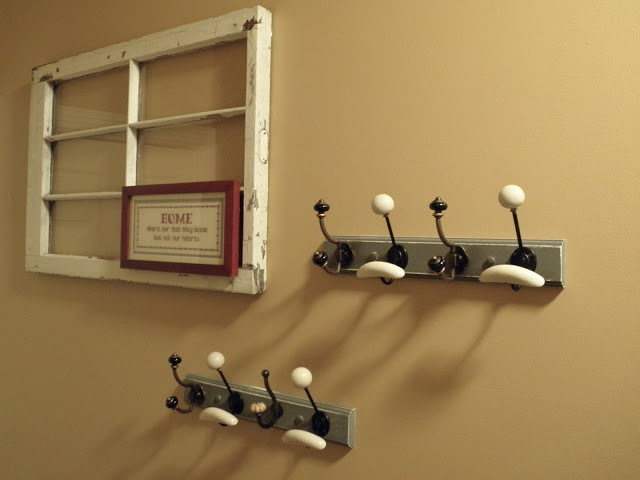 Back to the mudroom….. 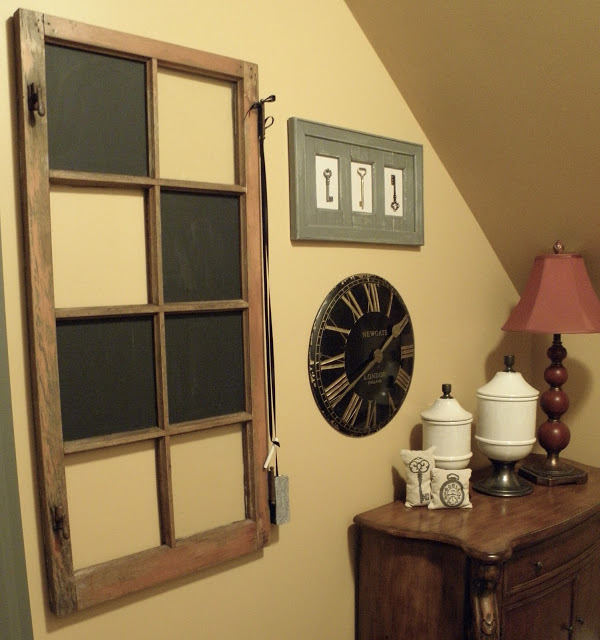 I switched out the hooks on our coat racks, and then hung another old window just as it was when I got it and then hung the picture on the window. This is Lauren’s bedroom at home in Wheaton. I had this large wall that I wanted something on, yet I didn’t want another picture in the room. 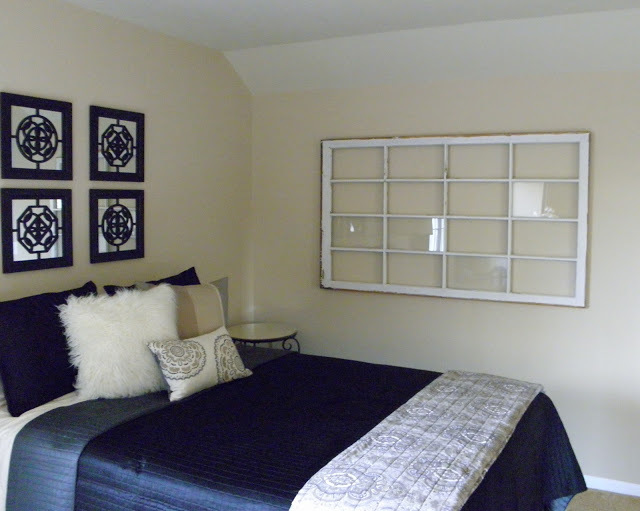 This large window was way to heavy to hang with all the panes in it, so I knocked all but five of them out, shined up the glass on the panes left on and hung the window on the wall. I love this! 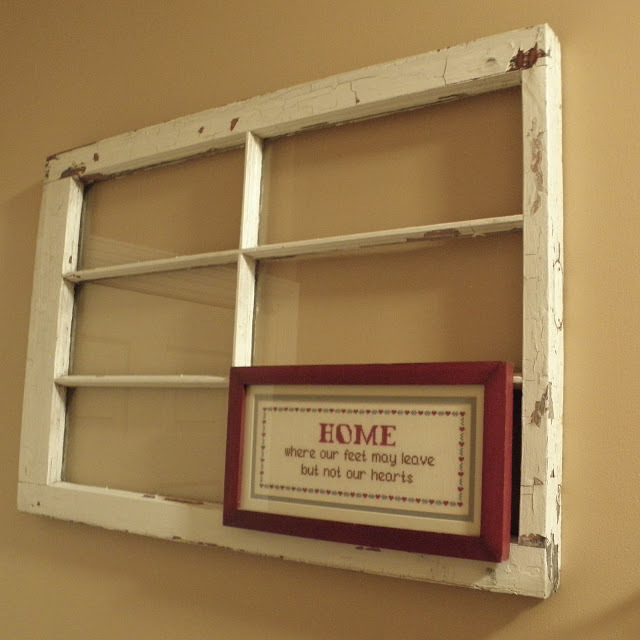 Plus, this too is another window from the home my husband grew up in, so it has great sentimental value. 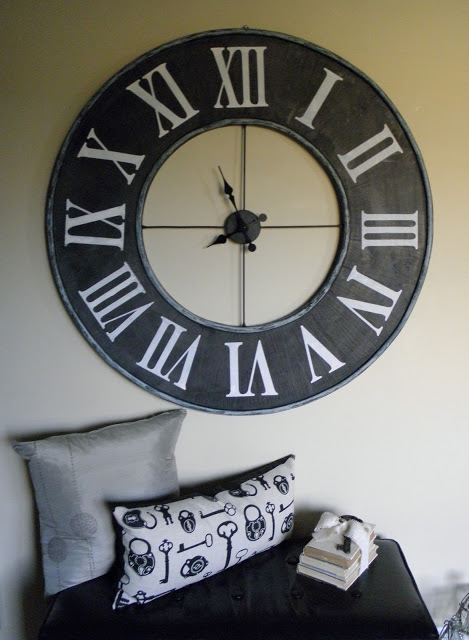 I found this great clock at Home Goods (I’m a Home Goods addict!!) I didn’t like the trim color, so I changed it. (That’s maybe anther post…..if I get invited to guest post again!!) Those books, old books that I wrapped in old cream paper and tied a ribbon around them and tucked a big key I found at Hobby Lobby. Wow! This was fun!! Lauren has me making jewelry now, maybe blogging is in my future too! 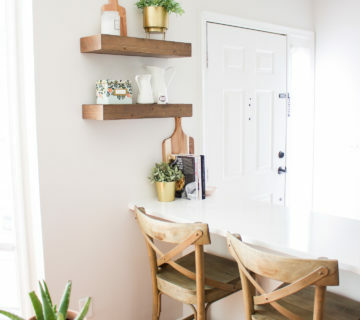 I love to share inexpensive decorating ideas! Love the ideas! Super cute stuff! Keep all the good stuff coming, and enjoy your weekend! Love all the ideas! Thanks for sharing! Thanks for the decorating ideas "doodle" 😉 I agree- blogging is in your future. Enjoy your weekend together! Nice to meet you doodle! 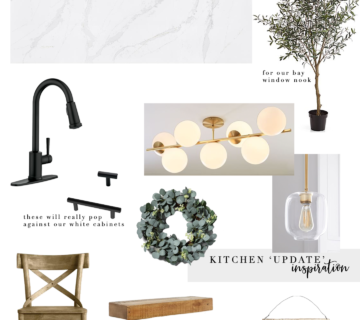 Thank you for sharing your decor ideas! I LOVE LOVE LOVE old windows but I live in south Florida so whenever i find one it is greatly overpriced! Maybe someday I'll find just the right one! Thanks again! yay, the commenting box is working! I love love love the mirror in the bathroom! I'll keep an eye open for it! your mom? more like your sister! she is an incredible decorator. She needs her own blog if she hasn't already..